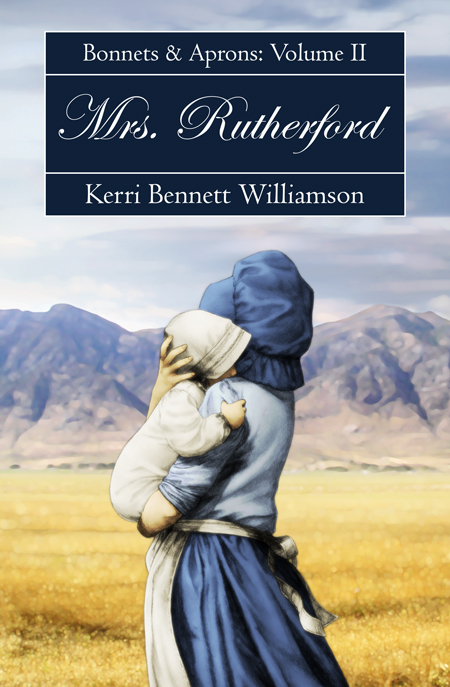 Originally written as the second part of my two part novel, ‘Bonnets and Aprons’, Mrs. Rutherford tells the continuing story of Fionna, who finally gets married and then joins the great migratory expansion west, ending in the Salt Lake basin territory. When told just a little of the story to help inspire the cover idea, my daughter Brina thought to give Mrs. Fionna Rutherford her own baby to hold, thus representing her married and motherhood life. Again, Fionna wears a prairie bonnet and apron, and hides her hair-color or facial features: to be left to the imaginations of her beholders. Of all my seven American historical backdrop novels thus far, this one has the most information of history woven in. There is mostly Utah history, since the story takes place in that territory (starting around 1850), but there are also U.S. historical details as some backdrop. I did a good deal of research, mapped out a timeline of anything in Utah or U.S. and even world history that might be relevant to the character, and then when I wrote that portion of the story, I included what was pertinent to the character and what she knew or cared about at the time, along the way. One inspirational element that played a key part in this story came from over three hundred pages of type written copies of actual journals from Utah pioneer women (written around 1850 or so). I read all the journal excerpts over twenty years ago, but I still distinctly remember the sense and even details of what those women communicated about their lives and their feelings. One of these years, I plan to write at least one or two more installments under the ‘Bonnets and Aprons’ banner (mostly because many of my readers have asked me not to forget Fionna and to offer more of ‘her’ stories). I have sketched in some stories about Fionna’s siblings and children, but they each remain on back burners for now. Many other stories have jumped ahead in line and simmer or bubble more actively at the forefront. And so, for now, I write what begs most to be written.